Che Milan’s mother has recently died. When an urn of ashes arrives, along with a note reminding Che of a half-forgotten promise to take her mother to Canterbury, the same day that a "Dear John" letter arrives in the mailbox Che finds herself undertaking a pilgrimage. She joins a group of women who are walking the sixty miles from London to the shrine of Becket in Canterbury Cathedral, reputed to be the site of miracles. In the best Chaucer tradition, the women swap stories as they walk, each vying to see who can best describe true love. Che, who is a workaholic, loses her cell phone at the first stop and is forced to slow down and really notice the world around her, perhaps for the first time in years. It's interesting how The Canterbury Tales by Geoffrey Chaucer pilgrimage is similar in many respects to the Broads Abroad pilgrimage with the time of year they journey, that Che joins a diverse group of women on the Broads Abroad tour at an Inn or how each of the women share there own tales along the journey. The tales they share with each other are heartwarming and heartbreaking. My favorite was Silvia's but I will let her tell you her own tale. Che is a Wine blogger who reviews the wines she drinks so the women drink a lot of wine in this book and there are a few quotes that I loved about wine. I encourage you to buy your own bottle of wine to sip as you savor their tales and the divine words that are used for inspiring quotes. 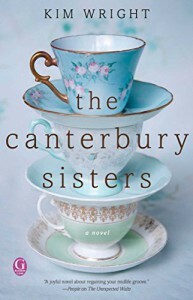 Oh, and turn off your phone while you read this book or when you take a few steps toward Canterbury. "Because books contain stories of things that have already happened and the liquor bottles on these high shelves before me hold stories of what is yet to be." "And this goblet, I think, looking deeply into the one in my hand... something unexpected waits for me in the bottom of the glass. Some story will begin when I take my last sip."